With more than 5 billion active phone subscriptions, and related trends in objective-self, smart health, and sensor-based analysis, human lives are being captured at scale and resolution never possible before. This data allows us to study multiple human phenomena and understand human behavior in ways not possible before. An ability to understand human behavior including activity levels, location patterns, sleep, consumption, and communication and social interaction allows for highly detailed and personalized data collection in a far more granular, unobtrusive, and affordable way than earlier. This research project is investigating the interconnections between human social and mobility behaviors and general wellbeing, self-esteem, and mental health. 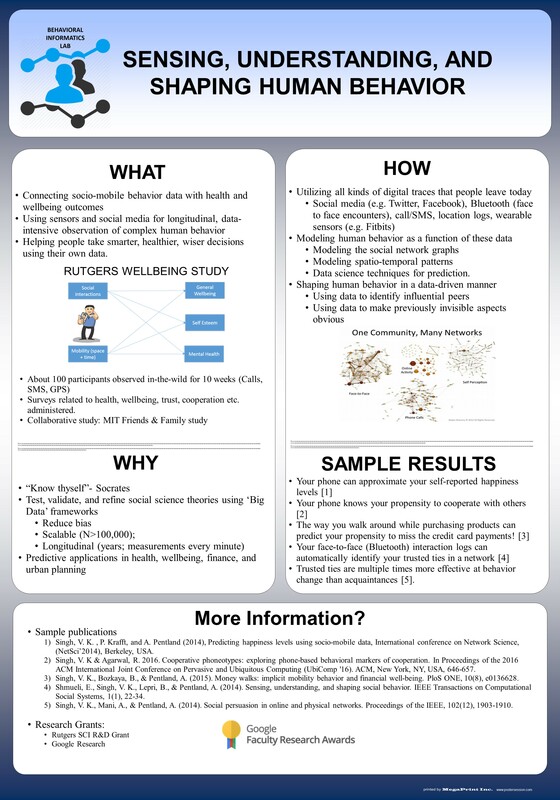 Specifically, the project is investigating how socio-mobile data (such as GPS locations and call logs) from users’ personal mobile devices can be used to understand the interplay between socio-mobile behavior and wellbeing, and how any changes in user wellbeing can be automatically detected via this data, which may potentially lead to future appropriate interventions. In this study, detailed socio-mobile logs for about 60 participants were collected for 10 weeks on Rutgers campus during Spring 2015. The same participants were asked to fill in a number of surveys related to wellbeing. This project has resulted in multiple publications on the aspects of predicting cooperation and privacy needs. Data on other aspects (e.g. mental health) are being analyzed and will be released publically soon.